The stock market in India is in great shape for almost 4 years now. Readers can verify the articles we wrote at the end of 2015 with a very bullish India stock market forecast. As in any secular bull market there is tactical bear markets, and, at a certain point, an end of the bull market. What to expect from India’s stock market going forward? The answer in the form of an outlook is here in our India stock market forecast for 2019. Arguably, this is more of an outlook rather than a forecast! The Nitfy 50 index (NIFTY) representing the largest 50 companies on the India stock market exchange rose from 7,000 points at the end of 2015 to 11,751 points in September of this year. That’s a 57% increase in 3 years. Is this a reason to sell, to take a wait-and-see mode for a while, or buy? The outcome of our India stock market forecast for 2019 should provide guidance to this question. Before answering the questions outlined above we want to highlight that our India stock market forecast for 2019 is strongly influenced by intermarket dynamics. No surprise, there is a strong correlation with emerging markets (EEM), no surprise, as India is one of the largest markets. As explained in great detail in our Emerging Markets Forecast For 2019 both the emerging market currencies (CEW) as well as the Euro are leading indicators. All in all we believe our India stock market forecast for 2019 is not negatively impacted by leading indicators of emerging markets. We will get worried if the Euro starts falling (sharply) as well as emerging market currencies. 10-year Yields in the U.S. are at a major turning point, that’s what we wrote in End Of 40-Year Bull Market In Bonds. They are trying to end their 40-year falling trend. This, of course, is breaking news, regardless whether mainstream media talk about it or not. If, and that’s a big IF, Yields will continue to rise, it will put pressure on the U.S. Dollar, and favor emerging market currencies as well as the Euro. This, for us, is one of the important indicators for our India stock market forecast for 2019 and beyond. We have said it many times before: news is the lagging indicator. Investors tend to search for news as they want to understand the India stock market forecast, similar to any other market forecast. Believe it or not, most investors get trapped by information overload. They read and keep on reading until they get rely solely on information and news. As per Tsaklanos his 1/99 Investing Principles, just 1% of the news is relevant to investors. If we go back to our previous India stock market forecast (last year) we find some interesting news articles. Now, one year later, with the Nifty 50 index trading 1,500 points higher (some 15%) we can clearly see that news tends to be lagging indicator. Stay away from 99% of the news, for any market forecast. Any forecast should have a fundamental component, though we do not consider fundamentals as leading indicators. News is a lagging indicator, fundamentals are supporting indicators, a small number of charts are leading indicators. Some of the important fundamental growth measures in India, according to TradingEconomics, are outlined below. First, is a strongly rising inflation rate is bullish for its stock market. 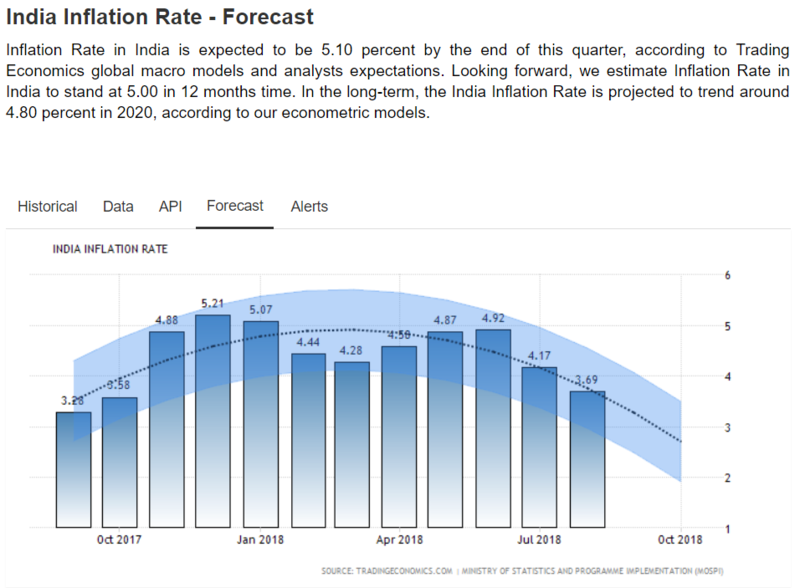 India’s inflation rate is declining right now. Typically, it rises in the first half of the year. The forecasted economic indicators for 2019 look much better. 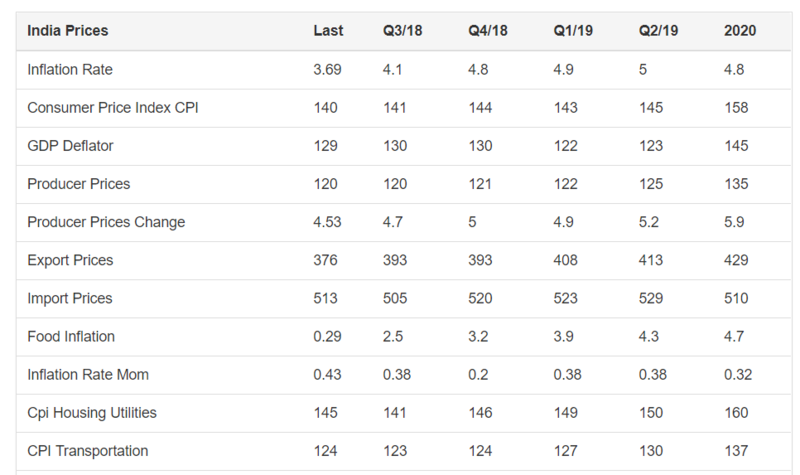 As seen on below table, inflation rate, as well as most other economic indicators, tend to stabilize in Q3, only to go up sharply in Q1n and Q2. That’s what we see for 2019 as well. 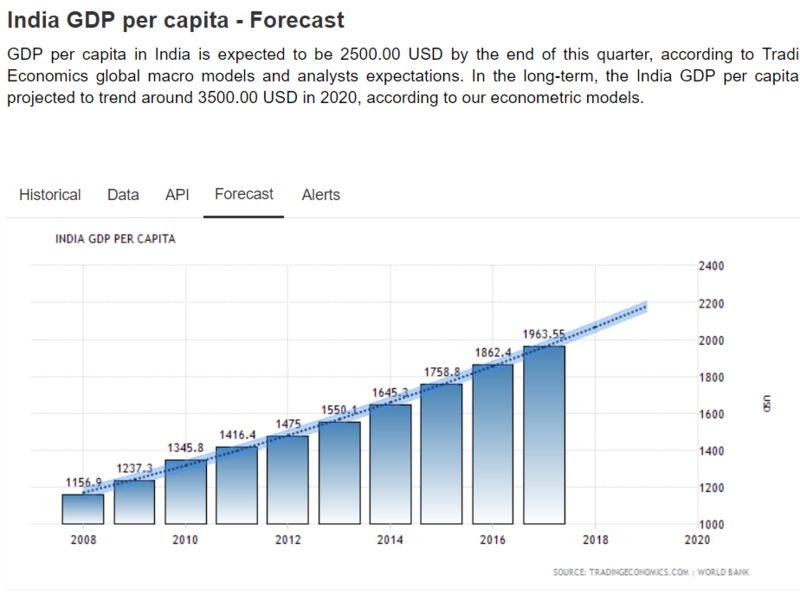 The GDP per capita is in a rising trend, as per this GDP per capita forecast at TradingEconomics. Given the economic fundamental data points and leading indicators outlined above we sense that India’s stock market is now at a decision point. That is visible on its chart as well. Leading indicators support a bullish India stock market forecast for 2019 while economic data show a classic slowdown in the last months of the year. Provided economic data improve, as per the forecasted figures above, we will see this reflected on India’s stock market chart. As explained in our 4 Top Emerging Markets in 2019 the long term chart of India tries to move from the current rising channel to a higher one (not created yet on the chart). That’s the key in forecasting: try to identify a point where a market is heading towards. We strongly sense that India will accelerate its rise. If that’s what is happening right now we will see a similar move as the one in 2005 where India moved to a higher level channel. So, in sum, if economic data and leading indicators continue to favor India’s stock market, and Nifty 50 continues to trade above 10,800 points, it will likely accelerate its rise. In this case we will see 15,000 points in India’s stock market in 2019. If 10,800 points cannot provide support we see a decline between 8,500 and 9,500 points, where a strong bottom will act as support. We anticipate a rise back to 11,000 points in 2019 in that scenario. In other words, the line in the sand for our India stock market forecast for 2019 is 10,800 points in the Nifty 50 index, combined with its 2 leading indicators and economic indicators. How is our India stock market forecast for 2019 playing out as 2019 kicks off? The first chart which represents the Nifty 50, top 50 companies in India, helps understand the points made above. There is this other key index for the Indian stock market: the Bombay 30 index. Below is the chart of the Bombay 30 index. It makes our point. The conclusions from back then are still applicable other than decision time is really close now! What this second chart adds in terms of value is that it shows even more how important this make-or-break level is. The giant triangle in this specific form will have major implications once it breaks out or break down. It is a matter of time until a trend starts in the Indian stock market. If there is one thing that characterizes India’s stock market right now, at least on their charts, it really is indecisiveness. Let’s review both indexes which we also discussed above, in our original outlook. First, the Nifty 50 index. The stock market in India is in Nomansland. Literally. Our outlook on India’s stock market really depends on what happens around current price levels. The monthly chart pattern which is the dominant trend of India’s stock market is flat currently. As soon as it breaks down or breaks out we will be able to get out of the indecisive outlook we currently hold. Interestingly, India Times reports that anothere index, the Bombay Stock Exchange 30 sensex index, has recorded its longest losing streak in over 8 years. With this poll it summarizes the gainers and laggards in February of 2019. Unfortunately we cannot derive any meaningful conclusion with regard to our India stock outlook! Similarly, the monthly chart of the Bombay Stock Exchange 30 sensex index does not reveal any new trend or trend change in its long term dominant pattern. We see exactly the same set up as in January and last September! The same conclusion comes to mind when it comes to India’s stock outlook: indecisiveness. Until further notice we do not see any other outlook for India’s stock market!